The heart of the Geek Movie season traditionally runs from late spring through the summer, with the superhero films and action flicks rolling into theaters for the warm-weather months. There are exceptions, however: The adaptation of the final installment in the The Hunger Games series arrives later this month and there’s a little flick called Star Wars: The Force Awakens that opens in mid-December. Still, the last two months of the year traditionally see the serious films, aiming for Oscars and more viewer attention span with people taking time off around the holidays. If you’ve lost track of what else is on the way to your local cineplex, here are a few sites to keep you in the loop. ComingSoon.net not only features trailers for a huge selection of upcoming theatrical films headed your way, you can get sneak peeks for upcoming TV episodes, home video releases on DVD and Blu-ray and even videogames. ComingSoon.net also has the latest Hollywood box-office figures as well as industry news and is really a one-stop shopping trip for entertainment information. Twitter, Facebook, Google+ and RSS feeds keep you up to date. 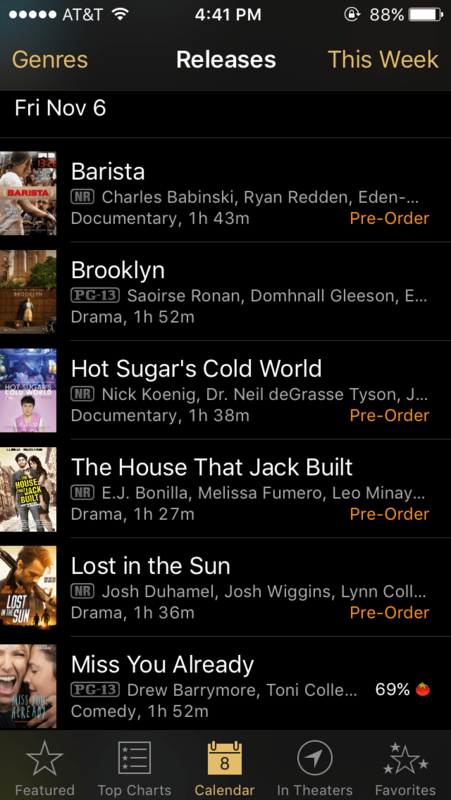 Apple’s iTunes Movie Trailers collection focuses mainly on theatrical films, but also sports exclusive clips and early previews. The site also has a Twitter feed and RSS to alert you to new material, plus a Top 25 list. You can view the trailers on the Web, but if you have an iOS-based gadget, you can use the official iTunes Movie Trailers app. You can also watch through the Apple TV’s app. Both feature a calendar view that places each trailer on a grid, which can be helpful for planning your weekends. 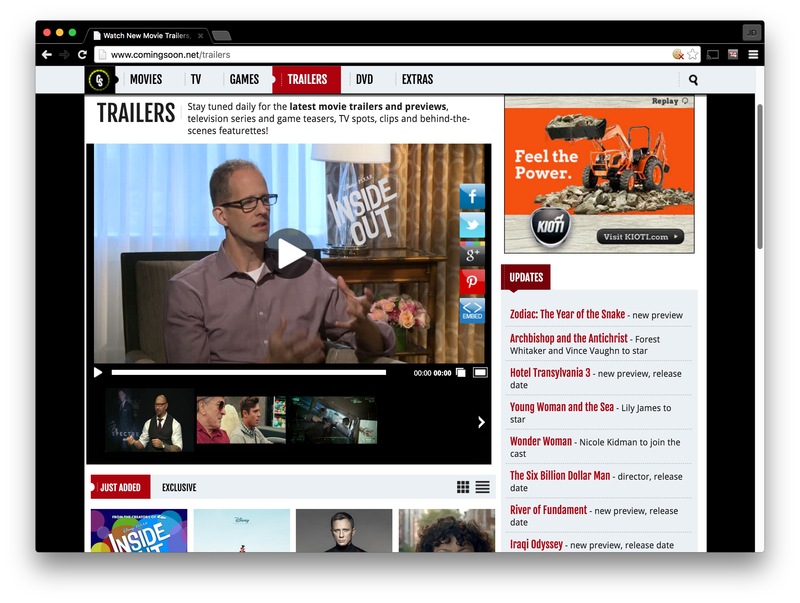 YouTube, repository of almost all online video, has a trailers section with links to a lot of clips – and YouTube channels from other trailers sites. If your tastes run toward more independent efforts, check out the IndieWire site. It does cover the mainstream movie and TV culture, but gives the smaller productions a bigger share of the spotlight. And if you’re feeling nostalgic and have a few hours to kill, visit the Archives at Movie-List.com to see many of the Generation X Classics as they were first presented in trailer form. Airplane!, Escape From New York, Ghostbusters, Raiders of the Lost Ark, WarGames…they’re all here in one convenient place, waiting to take you back to the 1980s, when movie tickets were cheap and a bucket of popcorn was affordable. And with the trailer buzz for Star Wars: The Force Awakens still echoing, how about a nostalgic trip over to the trailer for the original Star Wars from the mid-1970s? It certainly had a more low-key unveiling back in its day, and it and perfectly illustrates the power of the John Williams soundtrack — by not actually having the iconic score rumbling around in the in the background.